In front of The Mohegan Sun Arena at Casey Plaza. 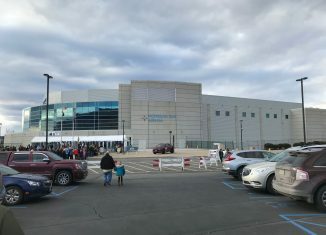 If you’re looking to see the future stars of the Pittsburgh Penguins, then drive up to the Mohegan Sun Arena at Casey plaza in Wilkes Barre. 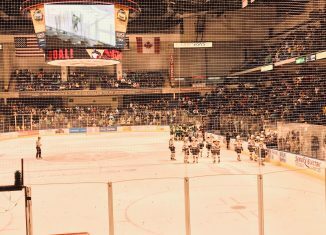 I had chance to attend the March 16th game against the Providence Bruins, Boston’s AHL affiliate. According to Google maps, the arena is 45 minutes from Bloomsburg. A view of the arena and rink from section 109. The Wilkes Barre/Scranton Penguins are the AHL affiliate of the Pittsburgh Penguins. The franchise is celebrating its 20th season at the arena and in Wilkes Barre. The game day experience is unlike any minor league team I have ever seen. The fans show their support for the black and yellow when they hit the ice. 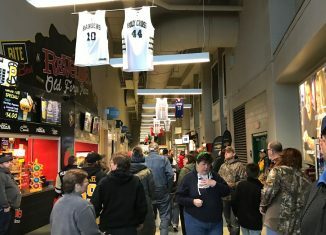 Some of the concessions near sections 106 and 105. The arena itself is very classic, but with some modern things. There are some well-known eateries such as Chickie’s and Petes, and Tim Hortons. If you don’t want concession food, there are variety of options outside the area. A couple restaurants I recommend are Grotto’s Pizza, which is located next to the mall and only 3 minutes from the arena, and Red Robin, which is only seconds from the arena as well. If you’re looking to spend the night after the game, I recommend staying at Hampton Inn, which is only four minutes from the arena. The Hilton Garden Inn is within walking distance if you’re looking for something closer. Penguins celebrating an overtime win against Providence. From section 110. My overall experience attending these games are good ones, I like seeing the rivalry game against the Hershey Bears (Washington Capitals AHL affiliate), the fans of the WBS Penguins get really intense. I’m not a fan of the Pittsburgh Penguins organization, but it’s always great to support the home team. Another benefit is the price of the tickets. So if you have time, check out a game and explore the arena as well. 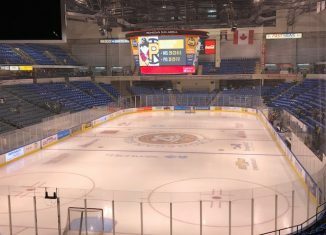 If you’re a die-hard hockey fan, then come out to support the Wilkes Barre/Scranton Penguins.